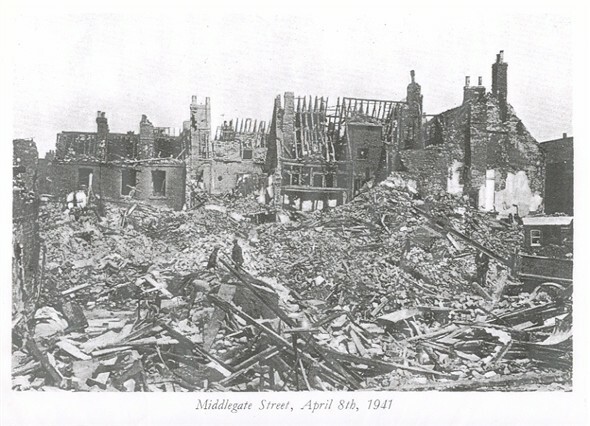 The first two photos illustrate the extensive damage done to the old streets of Great Yarmouth in 1941, the year when German bombing raids were most intensive. 109 lives were lost that year. 8 'wrens' died when their hostel suffered a direct hit in March 1943, though 40 women did survive. Perhaps you can identify where the last two photos were taken? Do you or any of your relatives have stories of what it was like to live through the air raids? Or were you an evacuee? if so, what did it feel like to return to a town where familiar haunts had been reduced to rubble? I wish someone would make a index of the streets which were bombed. My grandmother was bombed out three times and there were ten children in her family. Luckily they all survived. 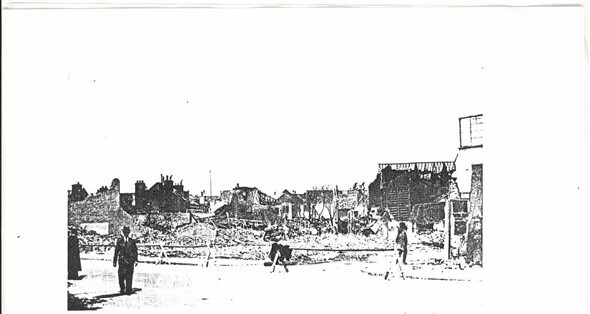 Item on the bombing of area in Great Yarmouth, reference the St. Nicholas Road houses next to the public house that was the Silk Mills, a Lacons property. During the war I lived at 188 Hgh Street with my mother, brother and grandmother. One night in 1941 a raid was on so mother and I went under the bed, which was in the front room, when all of a sudden there was a roar like an express train then a huge explosion. All our windows came in,soot from the chimney poured out into the front room. All went quiet so I went outside. Our front door had disapeared and there was a huge hole in the street. Water from the pipes was shooting up in the air and (there was) a huge smell of gas. 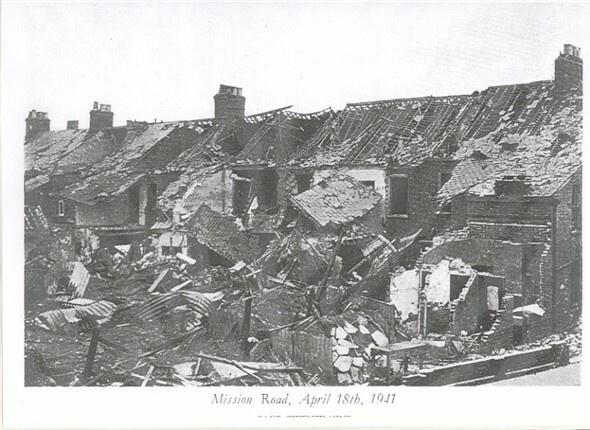 It seemed that five bombs had dropped, one in the river, the second knocked down five houses at the bottom of Ice-house Hill, the third went into the back of the Seaman's Mission in the High Street opposite our house, the fourth landed in the High Street and the last one in Duke Road. Another time I was standing at the top of Ice-House Hill when I saw a Heinkel 111k drop five bombs over the denes near the Nelson's Monument. The plane was so low I was looking at it straight ahead. I was 12 years old at the time. One Thursday I came home from school (Alderman Leach) and I told my mother I was going to the library to change my book. While walking down High Street I heard this roar and turning saw a ME-110 (us lads recognised all these planes) and he was firing straight down the street. I ran in one of the narrow lanes going down to the river and lay on the floor. I could hear the bullets ricochet all over the place. This narrow lane recently led down to Sommefields Store. Another sunny day me and a pal went for a walk in the country,now the Magdelen Estate, and another Heinkel-111 came right low and the front gunner started firing at us. We dived in a ditch but they must have been firing at the cattle because when we got out of the ditch,not far from us was a dead cow. 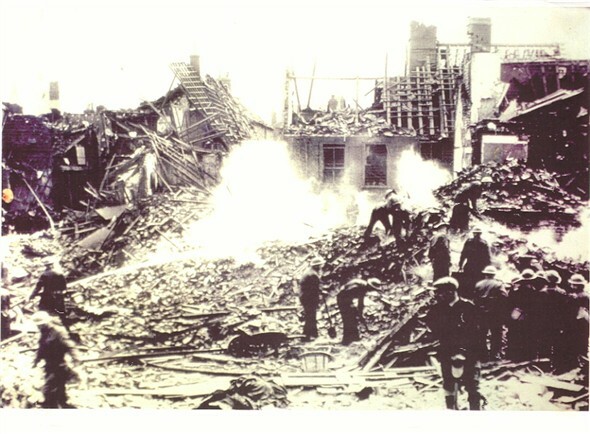 After the raids we used to go round and get all sorts of shapnel and I got the fins of the bomb which hit the houses on Anson Road, Southtown Rd. After we went to live in Newtown and I left all my bits of bombs at our house in Gorleston. My best friend was blown to bits when he went to see his father at the Sparrow's Nest in Lowestoft, he was called Harry Hoyle. Hello, I was a young boy (12) when I came to Great Yarmouth after the war in 1945. The children of The Netherlands who has a need to have a vacation could come in this city. And the famliy who lived there at the time was the family Glazier (Glasier) and the son that lived there his first name was Malcolm(?). He must be 76 (?) years now? That is so wierd my uncle lives on Anson Road and if I'm not mistaken accross the road from 69. Anson road in Great Yarmouth is actually situated in Southtown. With regards to these photos, it says under the pictures Great Yarmouth Museums. How many Museums has Great Yarmouth got and in which one would I find these photos, plus any more like these depicting Great Yarmouth during WW2. With regards to an earlier question, about an index of streets bombed, would the museum have infomation like that? I get to Yarmouth about twice a year, as I have a relative in Reedham and I am writing a novel about the detective in Yarmouth, which hasn't been published yet, but while I wait, I am writing a second story with the same detective, but in this one the story has links with the bombings in Yarmouth in 1943. I am hoping to get to Yarmouth in the next month and visit the museum where these photos are shown. Thanks, Clive. 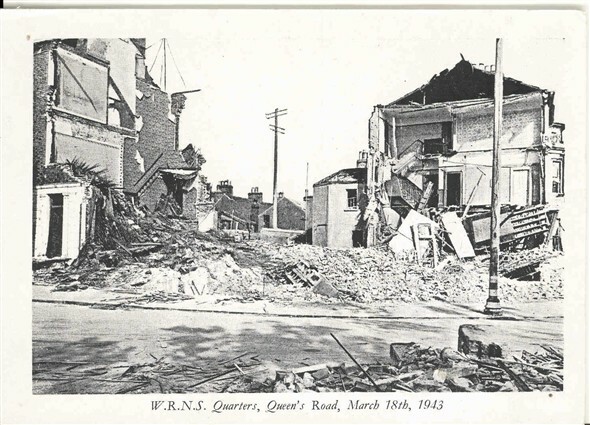 For those looking for bomb damage details about Great Yarmouth, the National Archives in Kew hold all the wartime survey maps which detail where the bombs were reported to have fallen. The Ministry of Home Security Bomb Census Survey 1940-45 is available by going to Kew and obtaining a reader's ticket. Bomb census maps are in the file series "HO 192" and 193. This is searchable on their website. Great Yarmouth has a file, for example, at HO 192/203, though there are at least 6 sets for GY listed. The quality varies, but they can be very accurate maps. I am trying to find a photo of 1 Middlegate St which was a Tavern that my family owned in 1891 (Anderson). Living in Australia in WW11 we only had a palm tree bombed in a few Nth Queensland raids nothing like this. maybe some before and after photo's would be good so you can see what changes happened after WW11 in the differant areas. My grandparents Basil and Jesse Wells were living in Southgates Rd until Feb 41 during the first week of Feb. My Uncle Kenneth was injured (and) he died 2 days later in Yarmouth General Hospital. He was 12 years of age. Shortly after this they moved to Walpole Rd where they lived happily until Grandads death in 1969. Grandma moved in with her daughter and son in law in Caister very close to uncle Kennys last resting place. Ref to item on Dutch school children coming to England after the war. We had some boys (being a boy's school) The Priory, staying with the school not one spoke any English. It was all sign lingo. The teacher who came with them was able to understand most words, in their last week with us some one bought the dutch teacher a smoking pipe /a pouch filled with pipe tobbacco no one owned up who bought it most of the lads thought I did but I still stand by what I said on the day (IT WAS NOT ME ). Now I wish who ever did it was a nice thing to do & they deserve the just credit, most of those boys are if still with us must know what it was like to be under Nazi occupation how lucky are we. I was born at 22 St. Mary's Lane, Southtown, next to St. Mary's Church. The lane was bombed in April 1941 luckily none of the family were there at the time, but we were homeless and had to live with various relatives during the war years. I can't remember the event really as I was almost 3 years old although I still have memories of actually living there. St. Mary's Lane no longer exists I think it was demolished due to the bomb damage. Does anyone else have memories of this? This posting is in response to Glynnis Hazlewood of 32 Northgate Street. My family (mother, father plus 2 brothers and 3 sisters) moved to 34 Northgate Street in 1946 and at that time the area adjacent was a levelled bomb site housing a large NFS water-tank. Very large beams extended deeply onto the bomb site to give our house support, a procedure very common in those times. The need for holidays after the war was such that my mother 'took in' visitors who as far as I can remember were not dismayed by the appearance of a house threatening to fall sideways. I remember the building of your house which, I think, was completed in 1949. I have searched my albums but do not have a photograph of the site. My best bet is that your house was identical to no 34. Thinking back I believe there was never any structural damage to my house in spite of the extensive damage adjacent. I left the house in 1953 (age 20) for National Service, get married etc. I am very interested about Great Yarmouth civilians during the second world war.If anyone would be interested in joining me discovering the headstones of our sadly killed civilians I would enjoy the company.I have found a lot of the borough headstones and a few private ones but I still have lots to uncover.please get in touch if you would like to help me. Great and very interesting site. I was looking for any information to do with the sinking of HMS Tonbridge off Great Yarmouth in which my great uncle was killed. Is there a memorial? Were any local people affected? I have recently bought a house on Beach Road Gorleston, a passer by informed us that during the war there was a bakery where the house now stands, and that it was bombed in 1940, the baker and his wife were injured, but a lady passing by was killed can anyone give me anymore information either on the baker i.e who they were or the lady passing by. My friends live in Apsley Road Great Yarmouth and they believe their house was bombed during the 2nd world war, would like to know if this is true please if anyone could help. I was born in Norwich in 1942, because my parents house in Caister Road, Yarmouth had been flattened a few months earlier. I went to Cambridge Uni and now live in Brisbane Queensland. I did spend most of my time in Yarmouth till the age of 10 with my Grandparents who showed me what would have been my home, after it was rebuilt. Do you have the addresses of homes destroyed ? I was born on Beach road my mother and fathers name was Mr and Mrs Harris. My father was a lifeboat man and joined the Royal Navy. We was bombed out in the early 1940s, my brother and I was upstairs under the bed we could not get downstairs the stairs as they had disappeared . My uncle who lived nearby came and lifted us down to safety, there was soot everywhere, my budgie laid dead in the bottom of the cage but we all got out. We was moved to Southtown road where we was bombed out again I was buried in the shelter and had to be dug out( I was about 3 yrs old). We was then evacuated to Derbyshire where we then had the news that my father was lost at sea doing convoys in the North Atlantic. Hi, I was made aware of a comment left by Mrs.A Thomas on 25/11/2014 and I would like to let her know that the lady who was killed was my great-great grandmother Mrs. Ella Caroline Bush. She lived on Cliff Hill rd. She was 75 years old. She had just popped over to the bakery when it took a direct hit from the bomb. Thank you for your inquiry, given me a chance to look further into my families past!